David Bowie was an artist in constant control of his ever-changing image. A look through his album covers and designer collaborations provides an insight into the many faces of Bowie. David Bowie, who has died at the age of 69, released 26 studio albums in a career that spanned six decades. The art direction of each LP is a reliable snapshot of his mercurial image and sound at the time – both of which were in a constant state of flux throughout his career. 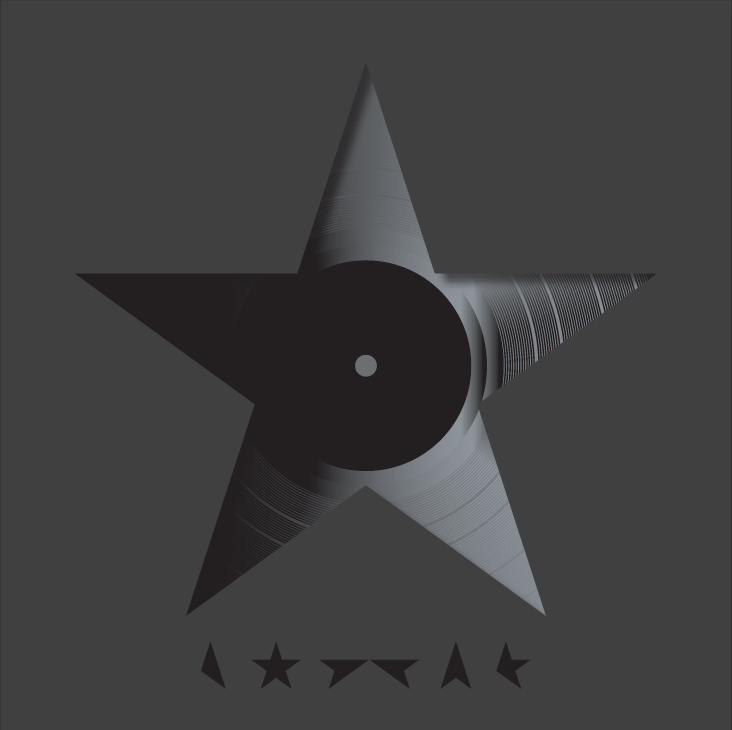 All Bowie’s albums bar the latest – Blackstar (2015) designed by Jonathan Barnbrook – bear his image on the front cover. A look through Bowie’s record sleeves therefore provides a glimpse of the many faces of the artist – from Ziggy Stardust to Aladdin Sane to the Thin White Duke, to plain old David Bowie. Having been first introduced to the world in the 1960s as fresh-faced, folky, whimsical Bowie, the 1970s saw the musician’s image take on a new seditionary direction. When Hunky Dory was released in 1971 Bowie had already appeared on the UK release of The Man Who Sold the World wearing a lovely frock designed by fashion designer Michael Fish. 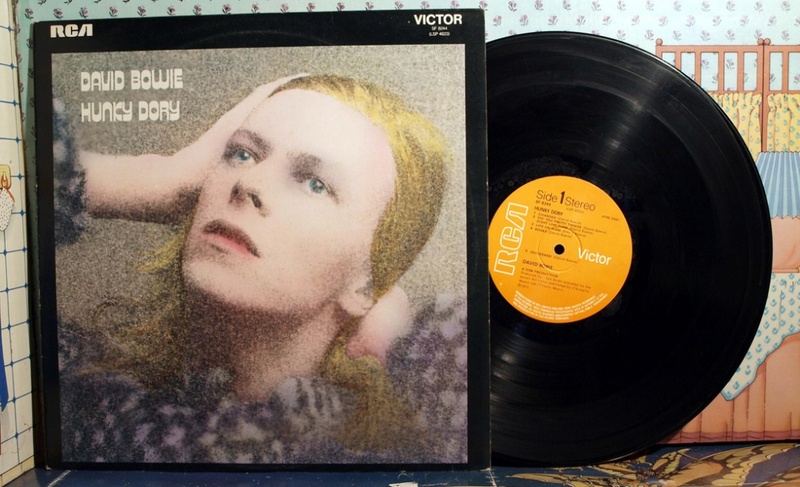 The main image in Hunky Dory is understood to be influenced by photographs of German-American actress and singer Marlene Dietrich, which Bowie took with him to the photoshoot of the album. It was designed by Terry Pastor and George Underwood. Incidentally Underwood is the school friend of Bowie who punched him in the eye, causing a permanently dilated left pupil and an iris which changed colour from blue to green. Arguably the most famous single image of Bowie, the shot on the cover of Aladdin Sane was captured by photographer Brian Duffy, who worked with make-up artist Pierre La Roche. Duffy has said in the past that the lightening flash look was a bolt of inspiration taken from seeing the ignition symbol on his cooker. The release spelled the death of Ziggy Stardust and the birth of Aladdin Sane. The image on Diamond Dogs is a painting by Belgium artist Guy Peellaert and features Bowie as Halloween Jack. The anthropomorphic human-dog figures were originally painted with doggy appendages but these were later taken out to spare our blushes. In the full painting Bowie is also sporting a fetching pair of dog’s legs. 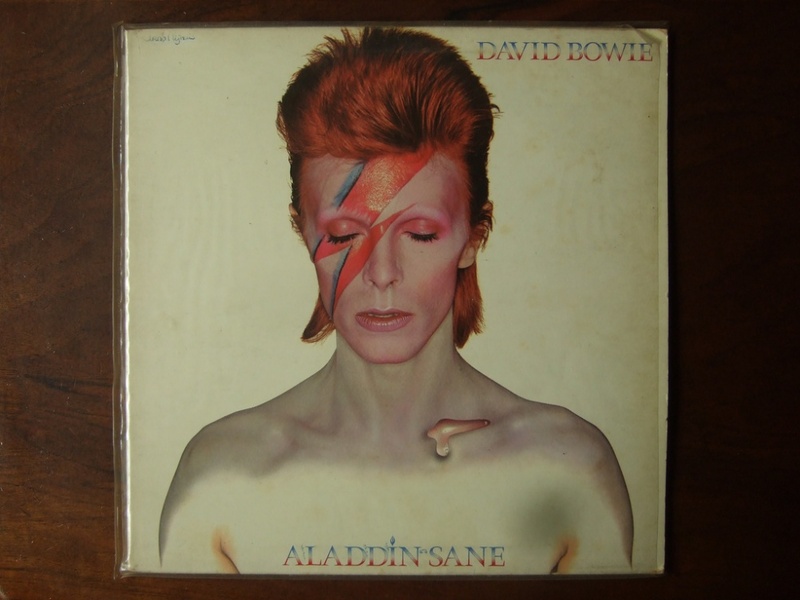 Note the Bowie wordmark taking on the lightening zig-zagging of Aladdin Sane. Bowie moving into acting only served to make his image even more fluid. The cover of Low is an image taken from a still in film The Man Who Fell to Earth. He was now the Thin White Duke and had used the same trick the previous year for the Cover of Station to Station, which is also an image taken from the film. The Station to Station image shows Bowie (as Thomas Jerome Newton in the film) stepping into a space capsule, which will take him back to his home planet. Bowie is understood to have insisted on the cropped black and white version of the image. While commentators have read much into its symbolism, it is notable that the album was recorded in the US and Bowie says he wished to return to Europe. Although Bowie’s previous grand personas were phased out in the 1980s, the look and feel of his albums still shifted rapidly. Let’s Dance (1983) marries a very ’80s wordmark with a photograph of a macho-boxing Bowie. The following year saw a bold saturated image created in the style of Gilbert and George’s Faith Curse for the cover of Tonight (1984). Perhaps the most evocative image of his 1980s era was the cover of Scary Monsters (and Super Creeps) (1980). It began as a Brian Duffy photograph, which was then painted by Edward Bell. The Pierrot-style clown costume from Scary Monsters… also pops up in the Ashes to Ashes video. The ’90s were a relatively fallow decade for Bowie, but 1997 saw the release of album Earthling. On the cover of the album, which is written EART HL I NG, Bowie is sporting a coat designed for him by Alexander McQueen. Jonathan Barnbrook designed the 26th and final David Bowie album and created a visual language, which is explored in different ways across formats including vinyl record, CD and digital download. The language uses the “★” symbol in lieu of any wordmark. 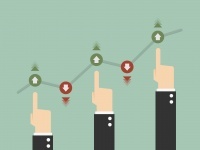 These symbols have also appeared in marketing campaigns designed to create a sense of intrigue and anticipation. 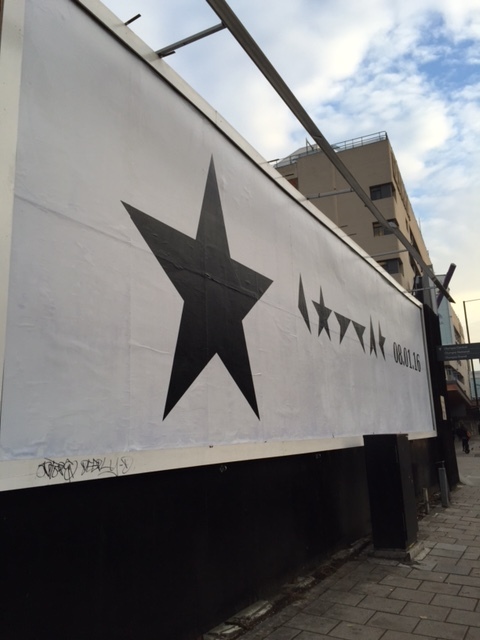 Barnbrook has revealed how the Blackstar project came together in an interview with Creative Review. 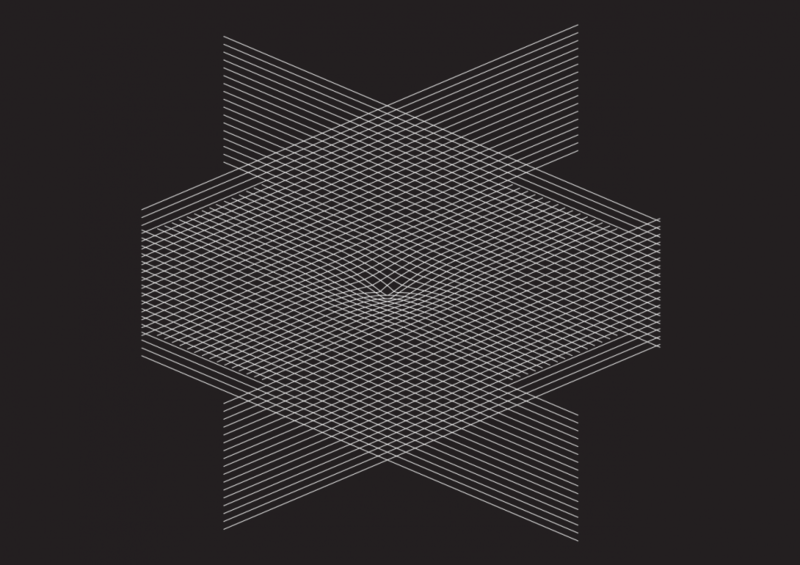 Blackstar is the latest of several collaborations between Barnbrook and Bowie. The Next Day (2013) saw the designer subvert the cover image of Heroes (1977). 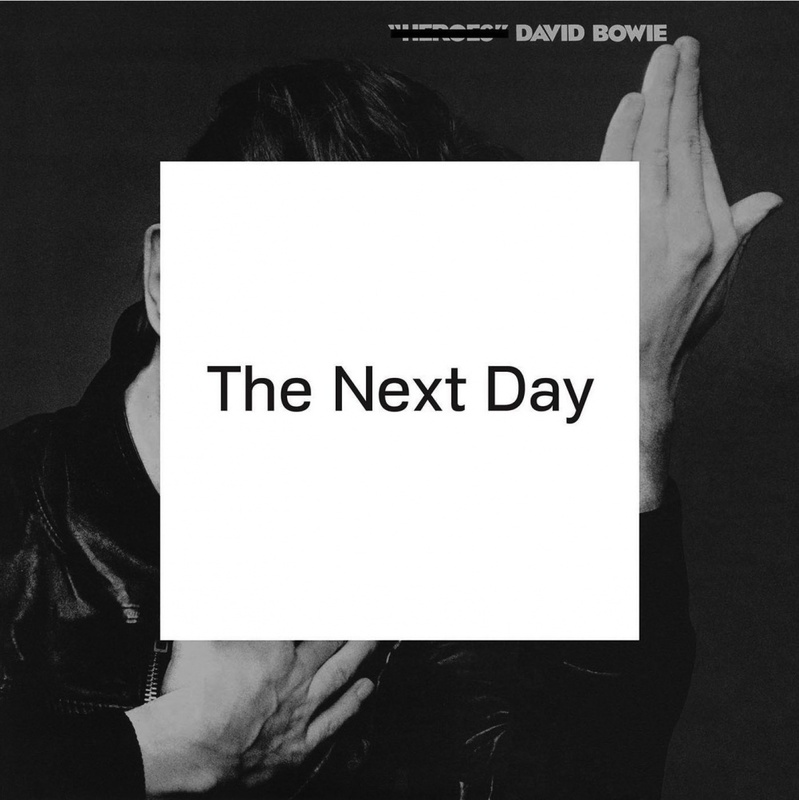 Doing this was deliberately iconoclastic and Barnbrook says that he chose Bowie’s “most revered” record for the project. Conceptually the cover is a comment on Bowie’s absence from the music scene and the monochrome look chimes with the mood of the album. Barnbrook first worked with Bowie on Heathen (2002), which had a heretic, anti-religious feel and featured his rather ungodly typeface Priori. The next year he worked on the cartoonish and unreal-looking Reality (2004).